In Niger this year, MSF medical teams may treat as many as 30,000 children for severe malnutrition – the overwhelming majority on an outpatient basis. Dr. Milton Tectonidis, nutritional specialist for Doctors Without Borders/Médecins Sans Frontières (MSF), just returned from one month in Maradi, Tahoua, Aguie, and explains how home-based, outpatient care has allowed MSF to treat many more children. What would be most effective from a medical point of view is to insist that therapeutic food for severely malnourished children – like Plumpy'nut or BP 100 – be integrated into the regular services offered in the health care system. How have new developments in treating malnutrition helped MSF try to address the scale of the problem in Niger today? We are treating most of the severely malnourished children on an outpatient basis. In other words, we see the children who are able to eat and who are not acutely ill once a week. We provide them with two packets a day of a relatively new ready-to-eat therapeutic food called Plumpy'nut and consult them medically to make sure they don't have any complications. We also give their mothers supplementary family rations of Unimix (a therapeutic flour) and cooking oil. Plumpy'nut is basically a specialized food that includes all the macro and micronutrients in the right quantities and balance to promote rapid growth in a malnourished child. And only the ones that are doing poorly – they are not eating or become sick – are transferred back to what we now call a stabilization unit – more or less a hospital setting – where they will be taken care of in a more intensive way until they stabilize. Then they can continue in outpatient care. This is not to say that these children are less severely malnourished. It just means that every child with severe malnutrition does not necessarily need to be hospitalized. This was already shown years ago in India – 20 or 25 years ago – in their big cities where malnutrition was a problem. The authorities gave people purees of lentils and things, and they reported that it was equivalent to hospitalizing the kids. For a long time nobody moved on it. Then, Steve Collins' Lancet article in 2002 led to a lot of discussion among nutritional specialists about home-based care for severely malnourished kids. The big thing, though, has been these specialized foods. They are ready to eat, don't require cooking or water, come in individual sachets, and can't become contaminated. All of this eliminates the risk of having to add water, which was the big thing preventing us from giving milk to kids at home before. We were always unsure how mothers would manage to dilute properly and whether there would be clean water because if not, it could have ended up doing more harm than good. 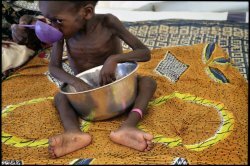 Has MSF's use of this method of outpatient treatment of severely malnourished children had an impact in Niger? We wouldn't have been able to treat nearly as many children. Before, we probably would have limited ourselves to Maradi, with maybe three or four fixed therapeutic feeding centers. 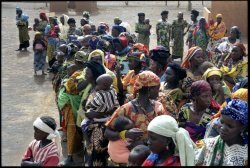 Caala, Angola, in 2002 was MSF's last big nutritional response that did not include outpatient care. Through 3 nutritional centers we treated 8,600 children, whereas we are heading towards 30,000 in Maradi and the neighboring areas. So it's a huge difference. The experience in Niger may make the combination of outpatient and inpatient care the definitive strategy for MSF. I don't think we can go back again. Are there ways for health authorities in Niger and elsewhere to alleviate some of the chronic problems associated with malnutrition? Everybody is talking about the chronic nature and the roots of the problem today - those debates will go on forever. But we have seen some of the longer-term insecurity over the past four years and have a certain idea of what is going on. What would be most effective from a medical point of view is to insist that therapeutic food for severely malnourished children – like Plumpy'nut or BP 100 – be integrated into the regular services offered in the health care system. It should be considered an essential medicine – just like ARVs for HIV/AIDS or ACTs for malaria – and not just during emergencies. Soon there will even be a new product to treat acute moderate malnutrition – this will make it possible to treat both degrees of malnutrition with specialized therapeutic food. It's imperative that these services be available. Women have come from miles away to our center for years to get treatment for their children. What memories do you keep from your mission in Niger? One of the things that I was most surprised by in my month here was when another agency distributed supplementary food at one of our outpatient sites. They had gone to a few villages to let people know about it – thinking that they better inform everyone because maybe they might not have enough people. And just by doing a little bit of mobilization they ended up nearly causing a riot. It just showed me to what extent people are short of food. And those who say that this is just a situation like past years are just wrong. There is a real food shortage in many households and a lot of catastrophic cases arriving at our centers.